Katelyn Ohashi stunned the crowd, coaches, teammates and judges, earning a perfect score for an electrifying performance full of gravity-defying flips, killer dance moves and a healthy dose of sassy confidence. 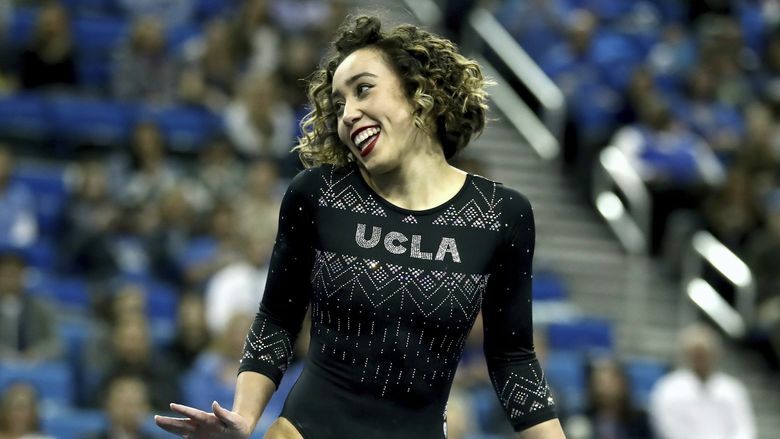 Executing a quick body roll with a giant smile plastered across her face, it was clear that the 21-year-old, Newcastle-born UCLA gymnast was in her element, as she kicked off her high-energy floor routine with a massive tumbling pass that ended in a flawlessly stuck landing. In the course of about one minute and 30 seconds, Ohashi stunned the crowd, coaches, teammates and judges, earning a perfect score for an electrifying performance full of gravity-defying flips, killer dance moves and a healthy dose of sassy confidence that has since gone viral with many heralding it as one of the best floor routines they have ever seen. For Ohashi, a one-time Olympic hopeful, viral fame is nothing new. At age 14, competing in the Pacific Rim Championships in a return to her native Pacific Northwest, Ohashi’s beam routine was harder than any other being performed in the world. At the 2018 Pac-12 Gymnastics Championships, she moonwalked her way to the title of NCAA floor champion with a Michael Jackson-themed routine that now has more than 4 million views on YouTube.